You probably know the importance of advertising on platforms like Google, Facebook, and YouTube. But what about Bing Ads? While Bing isn’t the world’s largest search engine, it does command more than 34.7 percent of online search volume. That means savvy digital marketers should learn how to leverage the power of Bing Ads. In this guide we’ll look at what makes Bing Ads great, and show you how to set up your first campaign. Bing is Microsoft’s search engine—an alternative to Google. It is the default Windows search engine on hundreds of millions of Microsoft products. That means that there’s a lot of people using Bing every single day—the same people who could be looking for your products or services. If you don’t use Bing Ads, you’re potentially letting a lot of money fall by the wayside. When it comes to launching an ad campaign, Bing and Google are very similar. Digital marketers need to conduct smart keyword research, then bid and purchase ads for those keywords. The search engine will then evaluate which ads best match the searcher’s intent for the keyword and rank the ones they believe will meet the searcher’s needs. But obviously there are some differences between the two platforms. Some studies have suggested that Bing Ads have a lower cost-per-click (CPC) than Google ads. Of course, the true cost of your ad depends on the keyword you’re bidding for. That’s why we recommend you test out both platforms. If you find one to be more cost-effective than the other, you can always shift the rest of your budget for better ROI. Bing has ad tools that allow you to assign campaigns to different time zones, search partner targeting, and search demographic targeting. Bing is also transparent when it comes to information regarding its search partners. This allows you to find out where your traffic is coming from and adjust your ad campaigns accordingly. Google has Bing beat when it comes to traffic by a long shot. It is the world’s largest search engine after all. But that’s not a knock against Bing. 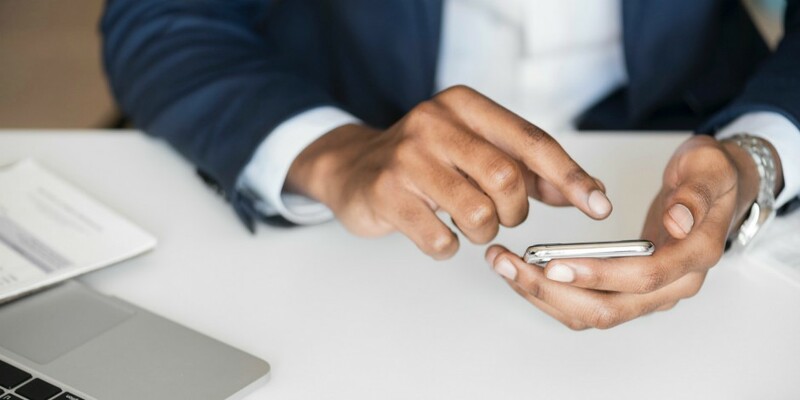 In fact, it means there’s less competition for digital marketers looking to target specific keywords—resulting in better ad placement and more affordable ads. This is all to say one thing: Don’t sleep on Bing Ads. In fact, they can be a very powerful way to increase leads and sales for your business. 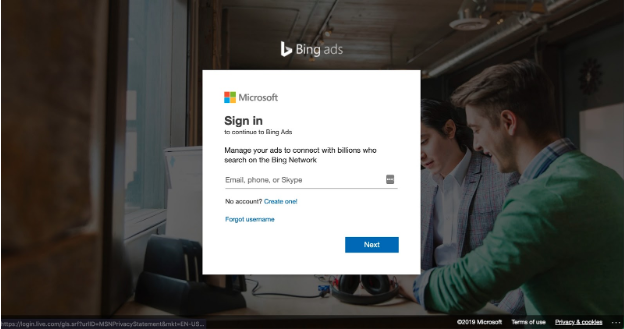 Now that we know exactly why you should use Bing Ads, let’s take a look at the exact steps to launch your first campaign. Go to the Bing Ads website and click on the Sign up now button in the top right corner. If you don’t have a Microsoft account already, that’s okay! Walk through the steps provided to create one. Once you do that, you’ll be taken to this page where you’ll be able to start your account. Once you provide all of that information, agree to the terms of service and click Create Account. Import data from an existing Google Ads campaign. This can really streamline the process if you’ve already been using Google Ads. Create a new campaign. This will be a new campaign from scratch. If you don’t already have an existing Google Ads campaign, don’t worry. Just move onto the next step, and we’ll get started creating a completely fresh Bing Ads campaign. If you do have an existing Google Ads campaign, select Import from Google AdWords (what Google Ads used to be called). Then, click on Sign in to Google. From here, you’ll need to enter the account name and password for your Google Ads account. Then select Sign in. Choose the Google Ads campaign you wish to import into Bing Ads. Then click Continue. You can also schedule when you want to import your data. This can be set to Once, Daily, Weekly, or Monthly. Click either Import or Schedule. This depends on if you’re scheduling it or not. Congrats! You’ve just imported your Google Ads data into Bing Ads. 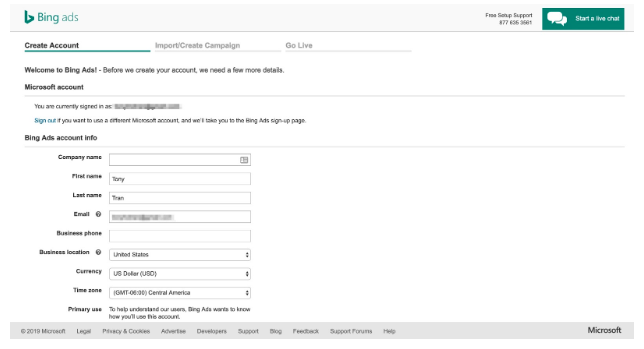 You can now go on to import Google Ads data from other accounts if you want. But it’s recommended that you wait two hours between each import. If you’re interested in creating your own Bing Ads campaign from scratch, move onto the next step. 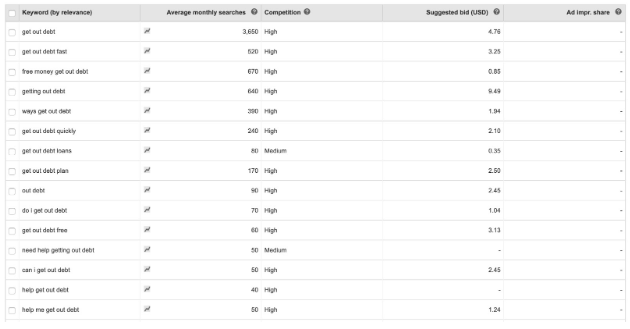 Choosing the right keywords for your Bing Ads campaign is crucial for success. That’s why this step goes before creating the actual campaign. You need to target the right keywords to target the right people—people who are looking for your product or service. This will help ensure a good return on your Bing ad investment. Once you find the right keywords, then you can start to build your campaign. 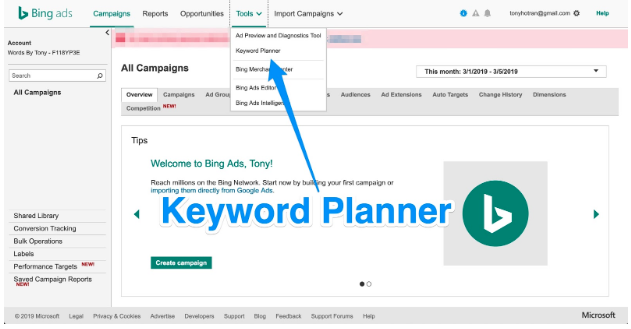 To conduct great keyword research for Bing, you’re going to want to use the Bing Ads Keyword Planner. You’ll find it under Tools in the main dashboard after creating an account. This is Bing Ad’s version of Google Keyword Planner. With it, you’ll be able to gather data on keywords straight from the search engine your users will be using (i.e., Bing). Find new keywords. This allows you to search for new keywords for your business to target. You have the option to search by using a phrase, website, or broad business category. Or you can search multiple keywords to find related keywords. Plan your budget and get insights. Here you’ll be able to get trends and search volume metrics for certain keywords, as well as get cost estimates for them. For our purposes, click on Search for new keywords using a phrase, website, or category. 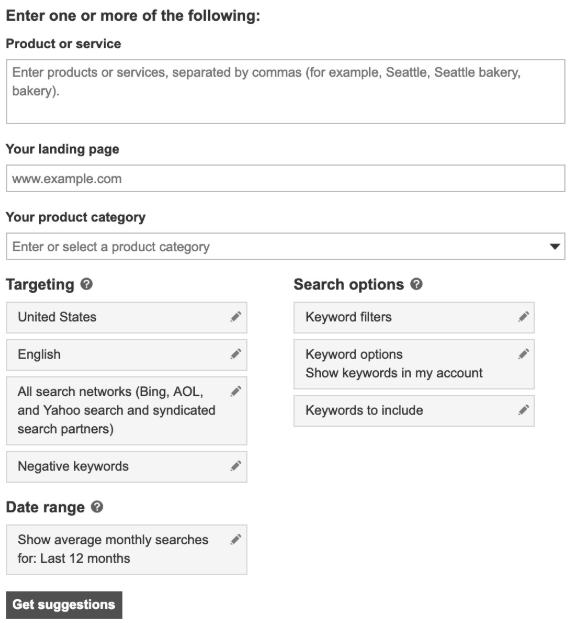 You’ll be able to gain potential keyword ideas by entering in either your products or service, landing page URL, or product category (or any combination of the three). Let’s say you have a personal finance website. You might write in “How to get out of debt” under the Product or service text box. And also keyword suggestions for other keywords you can target. These two lists also include information on the Average monthly searches, competition, and Suggested bid amount. For more on keyword research, check out our article on the best SEO tools for some solid web tools to help you out. Now that you know how to find some solid keywords for your campaign, it’s time to actually create the campaign itself. 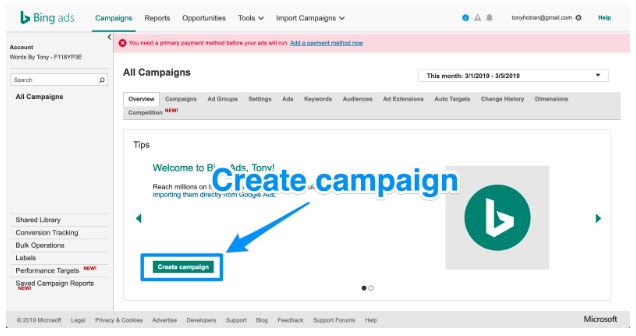 Go back to your Bing Ads dashboard and click Create campaign. Choose the goal that’s right for you. This is key to tracking ROI. Once you choose your goal, it’ll then be time to Create your ad. You’ll be taken to a page where you have the option to do so. Fill in all of the text you want for your search ad. If you need help, here is a great article from Bing with best practices on writing fantastic text copy. Once you’ve finished, click Save. Now it’s time to choose the keywords you want to target. Here you can enter in all the keywords you decided upon in step three. With each keyword, you’ll have the option to select their Match Type and Bid. Broad match. Your ad is displayed when a user searches individual words in your keyword in any order, or if their words are related to your targeted keyword. So terms like “get out of debt fast” or “how to get rid of debt” will match for your ad. Phrase match. 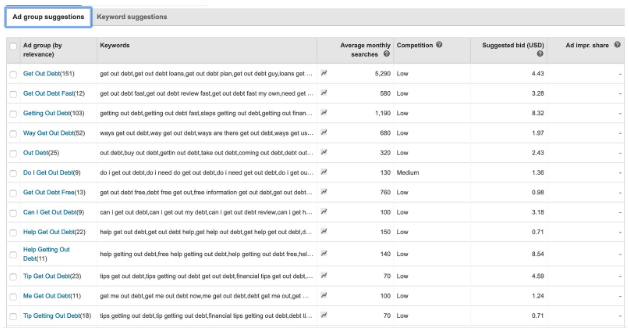 Your ad is displayed when all the words in your keyword match the user’s search. So searches for “How to get out of debt” or “How to get out of debt in a week” will match for your ad. Exact match. Your ad is displayed only when users search for you exact keyword. So only when users search “How to get out of debt” will your ad appear. Negative keyword. Your ad won’t display if users include certain words along with your keyword. For example, if you don’t want to target people who want to get out of debt fast, you might include “fast” or “quick” as a negative keyword. Close keyword variation. This is for when users search your keyword but might make a spelling or punctuation mistake. Different match types will cost different Bid amounts. Bing Ads will give you an estimate of what it might cost. 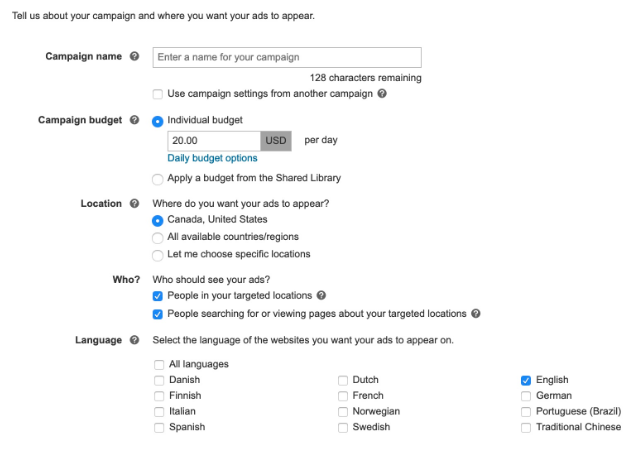 This is where you can choose the daily budget options for your Bing Ad, the location you want it to appear, who you want to see it, and what language you want the ad to appear in. Choose these options and click Save and add payment. Once you add your payment information, you’re done. Congrats—you just created your very first Bing Ads campaign! Bing Ads are an underrated tool for marketing campaigns. Savvy digital marketers know they can be an effective way to drive qualified leads and conversions. Remember: People are responsive to content that helps solve their problems. 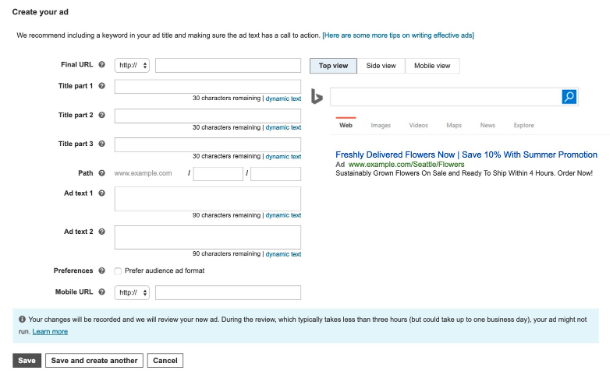 Provide that through your ad, and you’ll be able to create a lead generation machine with your Bing Ad campaign. Complement your digital marketing strategy with an engaging social media presence. Hootsuite can help you compose, schedule, and publish posts to all the major social platforms from one dashboard. Try it free today.